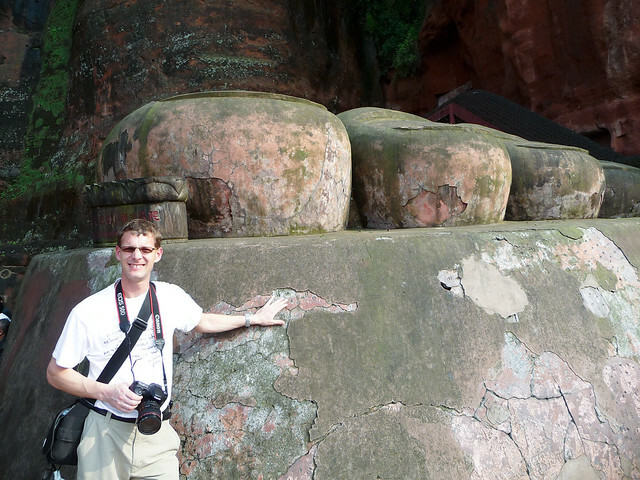 After a 2 hour bus-ride from Chengdu we arrived in Leshan and took a tour boat to get a panoramic view of the Giant Buddha (Dafo) from the river. The 71 m tall Buddha is carved into a cliff overlooking the river, and with a shoulder span of 28 m and 7 m long ears it was quite impressive. After getting back to the docks we entered the Giant Buddha park containing several temples, tombs and museums. We walked up the hill to the Buddha”s head and lined up for the steep stairway down the cliff to his feet (each big toe is 8,5 m long!). When leaving the park we found a local bus back to the bus station and were back in Chengdu around 7.30 pm. We walked from the bus station to the hotel and stopped for dinner on the way. Tomorrow morning we are traveling to Xining, and will catch the train to Lhasa in the afternoon.